As a translator, I use dictionaries nearly every day. But contrary to what many people might believe, I don’t simply look up words in a bilingual dictionary and then write down the first definition offered. Translation is about much more than approximately equivalent words. That’s why actual people are needed to carry out translation, rather than machines being employed. Only people can understand the context and see which of a variety of possible translations is the best choice. Monolingual dictionaries are much more useful for translators than bilingual ones and I wish people, including translators themselves, appreciated this fact. Monolingual dictionaries explain a language’s words in its own words. That is to say that rather than simply offering possible equivalents or near-equivalents, a monolingual dictionary offers you an understanding of how the speakers of that language define and use a word and what associations they get from it. This in turn helps translators pick the best possible translation. One cannot translate word-for-word; one translates the context as well, and the context includes all of the source language and culture. Translators should focus on studying monolingual dictionaries first and only once they have fully understood a word from the perspective of the speakers of a given language ought they turn to a bilingual dictionary to get a list of possible translations. 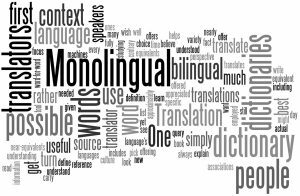 As a translator, my first reference tool will always be a monolingual dictionary, and I use it not only when I have a query about a specific word but any time when I want to learn more about the source languages I translate from. It’s the one book that can be read over and over again and yet still offer new and useful information. This is a guest post by Dr. B.J. Epstein who can be reached via her translation blog Brave New Words or her website. Buon appetito! Why are there no words in English to express my culinary triumph? I agree about the use of monolingual dictionaries. It is easy to not get out the real meaning of the word. I full agree that monolingual dictionaries are much better for students learning English rather than bi-lingual dictionaries. For one thing, in a monolingual dictionary, there might be more meanings rather than in a bi-lingual one. However, having said that, I first encourage my students to preferably first try to understand the meaning of an unknown word through my explanation; and to only resort to a monolingual dictionary or ultimately a bi-lingual one as a last resort and if all else fails. As a teacher of English to high school students in Vietnam, I ALWAYS recommend my students to use English – English – Vietnamese dictionary. This kind of dictionary is of great use to students as there are often mismatches between L1 and L2. I quite agree with Mariella Grech in that before asking students to use the dictionary, we teachers should encourge them to use the guessing techniques to deal with the new words. I’m both a translator and an English teacher and I totally agree with the advantages mentioned about the usefulness of a monolingual dictionary over a bilingual one. How can you translate a word if you don’t know what it means in the language it is used? Once you understand the word, if you can’t come up with a good translation, the bilingual dictionary may help you, never before. And if you’re learning the language, again the monolingual dictionary should be your first option, so you can have the word’s different meanings and, sometimes, collocations. After reading the content, I do agree with some comments and suggestion made by experts and readers that monolingual is the best way to learn, however I do think that bilingual is very complementary of the monolingual dictionary, I understand the argument of monolingual and bilingual dictionary, My attitude towards it is to team up with both get both results and reach a conclusion and analyses of its context and use it for a better understanding of a wide complexity of a language. My provisional assessment is that the complexity of translation is better solved by human’s, the machine however, can play a part as both the machines and human complement each other, the human does the thinking, and the machine, helps to solve a more mechanical complex in text structure and other elements.